CHICAGO, Il. 8/28/13 - THE SUB-MISSION is pleased to present 9-11-57, a site-specific installation by Tracy Marie Taylor. Taylor’s art practice focuses thematically on the history of the American West. Her new solo project, 9-11-57, is a memorial to the Mountain Meadows Massacre, a mass-murder led by Mormon militia members on September 11, 1857. 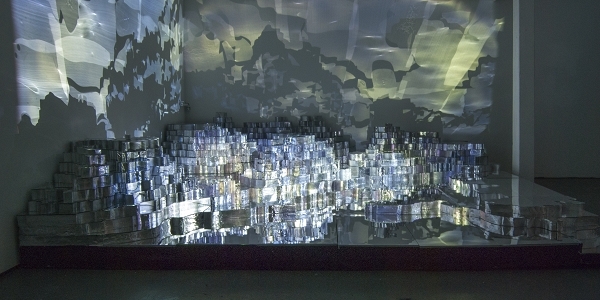 The installation features a three-dimensional, topographic sculpture of Mountain Meadows, Utah that is constructed of laser-cut, varied layers of mirrored Plexiglas. Collaged imagery of the sky, taken at the massacre site, is projected onto the sculpture from above. The projected light reflects chaotically onto the surrounding walls, creating a shattered effect. An audio piece accompanies the sculpture - a compilation of three first-person accounts of the massacre: Sallie Baker Mitchell, one of eighteen children who survived the massacre; John D. Lee’s confession, written in prison days before he was executed for the crime; and official investigators’ reports written to President Buchanan. Tracy Marie Taylor received her BFA in Studio Art from the University of New Mexico and received a Full Merit Scholarship to obtain her MFA from The School of the Art Institute of Chicago in 2001. She is currently an Assistant Professor of Art at Lake Forest College and chair of the Digital Media Design Program. Taylor lives and works in Chicago, IL.